We offer a wide range of silver antique items and silver religious statues, idols of gods and goddesses in silver like silver ganesh statues. this find usage in temples, residential areas and also commercial establishments. With the help of our skilled workforce, we manufacture these as per clients' specific order requirements. Finish: Silver plated with enamel color work. Owing to the efforts of our dedicated team of professionals, we have been constantly engaged in offering the best quality Silver Gautam Buddha Idol. We are making samovasaran, trigda, sinhasan, merushikhar is various sizes as per religious norms (shastrokt vaarnan). Trigada is made square in shape, smovasarans are made out of wood with silver, brass, germansilver sheets coated on it or given ganga-jamna finish. Menoshikar is a novelty made as per ancient theory with speciality carving. 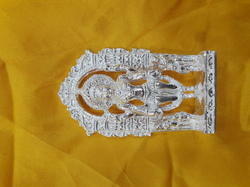 Silver idols of gayatri are available in all wieghts starting from 50 grams to 700 grams. Exclusive Ganesha Idol by JD Jewels, Made is 99 & 92.5 Silver Ideal for gifting or personal use , this attractive silver idol has made with pure Silver and comes with various size and shape. 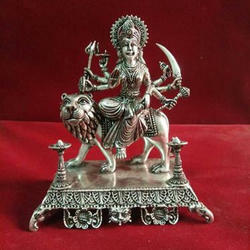 Ideal for worship, this silver Idol are considered one of the most auspicious gifts to present on any festival.